Fodonyx (meaning "digging claw") is an extinct genus of rhynchosaur from the middle Triassic epoch of Devon in England. 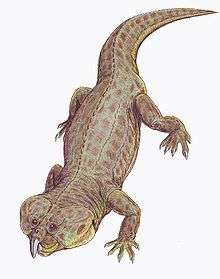 Its fossils (25 specimens) were discovered in Otter Sandstone Formation (late Anisian age) and were first assigned to Rhynchosaurus spenceri. This species was reassigned to its own genus, Fodonyx (the type and only species is Fodonyx spenceri), that described by David W. E. Hone and Michael J. Benton in 2008. More recently, one skull was reassigned to the new genus Bentonyx. 1 2 David W. E. Hone; Michael J. Benton (2008). "A new genus of Rhynchosaur from the Middle Triassic of South-West England". Palaeontology. 51 (1): 95–115. doi:10.1111/j.1475-4983.2007.00739.x. ↑ Max C. Langer; Felipe C. Montefeltro; David E. Hone; Robin Whatley; Cesar L. Schultz (2010). "On Fodonyx spenceri and a new rhynchosaur from the Middle Triassic of Devon". Journal of Vertebrate Paleontology. 30 (6): 1884–1888. doi:10.1080/02724634.2010.521901.